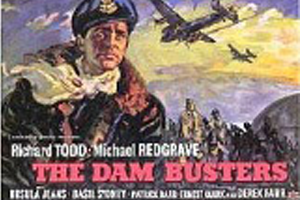 TheDam Busters are forever etched in my mind, beginning from an early age. About six if I recollect. Saw the movie with my Dad and was totally captivated by the bravery and achievement in the most difficult circumstances. When travelling on an aeroplane I often think of those brave souls. No air conditioning, no warmth, and in total darkness over hostile territory. It makes me feel in some way guilty to order a coffee or a sandwich. Most important me being able to travel on an aircraft in a free and democratic world is in part down to the sacrifices of those boys. Day1 Meet and Greet at Dortmund airport-transfer to Mohne Dam. Day2 VISIT AND TOUR OF MOHNE DAM. BOAT TRIP. EVENING FURTHER VISIT TO MOHNE AND FEW DRINKS! Stay in hotel near Mohne througout your stay. MOHNE DAM IN RECENT TIMES. We can ( if not too late) take a leisurely walk (OR TAKE A CAB) 5 km (30 mins walk) to the actual Dam. Note: there are no acceptable Hotels or Pensions with own private bath/wc near to the Dam . There is one Hotel 3 kms away, but £80.00 per person per night. Which means 20 minutes instead of 30 mins. 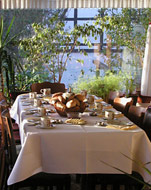 non hurried morning and towards lunchtime we take a boat trip to include lunch along the Mohne Lake. Afternoon we will be given a tour of the dam itself. Evening we will arm ourselves with a few bottles of ‘bubbly’, and drink a toast to ‘Guy’ and the boys. At the same time sparing a special thought for those who did not return, as well as the unfortunate innocent villagers who lived close-by. A wreath to 617 squadron will be cast out into the lake. Taxis back to our Pension. Morning but not too early!! We travel by mini bus to the Sorpe dam. The Sorpe dam was one of 617 squadrons 3 main targets on the night of 16/17 May 1943. 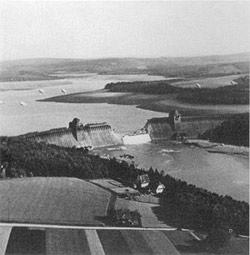 Although the other two dams the Mohne and Eder were each breached the Sorpe sustained only light damage. The Sorpe required a different and more demanding angle of attack as well as being constructed of a different and more durable core. There is not a great deal to see, or do here. But once everyone has taken photo’s or whatever, we will mark the occasion and spot with a wreath. 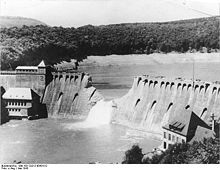 We will then return to our base at the Mohne dam. Having a free afternoon will provide the opportunity to take a sightseeing flight or simply ‘chill out’. During the evening we meet up with a local gentleman by the name of: Mr. Karl-Heinz Wilmes. 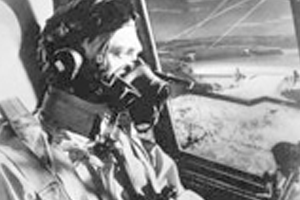 Herr Karl-Heinz witnessed as a child the bombing raid in 1943 and is prepared to talk to us about it. 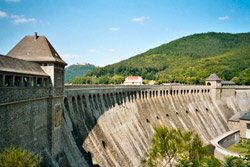 As well as the Dam, nearby is a museum which features the bombing and breaching of the dams. 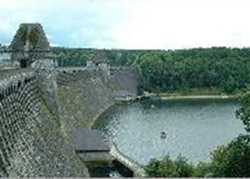 Whilst there we will also visit the “Waldeck” medieval castle, and a boat trip around the reservoir. We will taker lunch as and when everyone is ready. We will replicate the wreath laying here. We transfer to Dortmund airport. 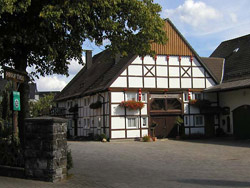 ACCOMODATION IN GERMANY. BED AND BREAKFAST. 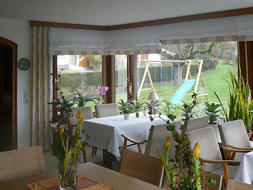 MINI BUS TRAVEL IN GERMANY, DORTMUND AIRPORT- PENSION -DORTMUND AIRPORT. TRIPS TO BOTH SORPE AND EDER DAMS. WREATHS. CHAMPAGNE ON SECOND NIGHT. OCCASIONAL TAXI TRANSFERS. THE SERVICES OF PAUL BABBAGE WHO WILL ACCOMPANY YOU ON THE TRIP. AIR TICKET. LAST TIME WE CHECKED IT WAS AROUND £80.00 RETURN TO LUTON. 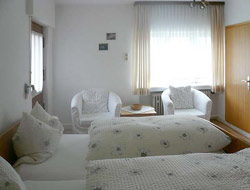 ABOUT THE ROOMS WITHIN THE PENSION. It’s understood some rooms may well be larger than another, or possess better facilities.Iit’s rare in any b & b that every room is identical. We have no control nor accept any responsibility for who has what , or shares which room. 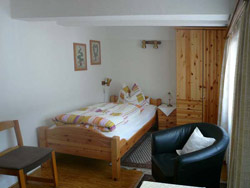 In the case of single travellers we will attempt to match you in a double room with another single party. However we will first place you in touch beforehand, in order that you are both ok to share. Alternatively we will attempt a single room in some cases there are no extra charges and in other there is. Much depends on time of year and bookings levels. We would also point out that in busy times we may have to split the group in terms of accommodation. For example 12 in the party, and only free rooms for 8. Being then faced with the dilemma of either the tour does not go ahead or we identify alternative accommodation for the overflow we may at our own expense pay for a higher level of accommodation for the overflow.